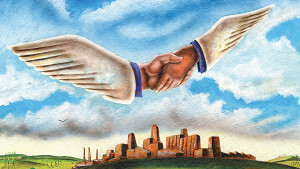 "Corporate America's best kept secret"
What is an angel advocate? It is the name used at our firm to describe those beloved clients who like us so much they are willing to put their own reputation on the line to refer us to their friends and relatives. My goal is to have 90% of our new clients referred to us by angel advocates. We are more than halfway there. In Minnesota, we had a five-month period where 100% of our new clients were from referrals. Creating angel advocates out of our existing clients starts with a list that will make your compliance officer love you. I have one overriding thought in every client interaction: If I were in arbitration, could I defend this recommendation to opposing counsel? As an attorney who has served as an assistant district attorney and a public defender, it is easy for me to visualize how brutal it can be for advisors to defend themselves in court or arbitration. Here are the steps we take to make sure every recommendation is defensible and builds trust with a future angel advocate. First: We only make recommendations in the client’s best interest. This is a mantra that I drill into the hearts and minds of every team member we hire. In fact, I won’t hire anyone unless they feel as strongly about this as I do. Once you have a clear North Star, it becomes very easy to give your clients solid, defensible advice. Your suggestions either line up with the North Star or they don’t. One example is the review we do on a client’s insurance products: If we think we can get them something better or cheaper, we will recommend they switch. If the client doesn’t need insurance, we tell them that too. If what they have is good, they are advised to keep their existing policies.